WDBB's Moonlight Graham Award recognizes those players who had the least amount of time with the Durham Bulls during the season. 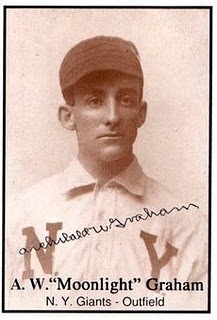 The award is named in honor of Archibald "Moonlight" Graham who achieved lasting fame as a character in the W.P. Kinsella novel, Shoeless Joe, and then became even more famous when he was played by Burt Lancaster (and Frank Whaley) in the Kevin Costner film, Field of Dreams. As a ballplayer he played two innings in the major leagues as a right fielder for the New York Giants in 1905. He never came to bat. You can look it up. He did, however, go on to a career as a well-loved physician in Chisholm, Minnesota. Of interest to us is that he was a North Carolina native (born in Fayetteville, grew up in Charlotte); graduated from UNC (where he played baseball); and was the older brother to UNC President and US Senator Frank Porter Graham. If you find him an intriguing character, the Wikipedia article is a good start. Then there’s a nice NBC piece done on him a couple of years ago. And then there's a terrific book by Fayetteville writer (and Bulls fan) Brett Friedlander and Robert Reisling, Chasing Moonlight. Copies of the book are in the Wake County Library system, Amazon, and I found my copy at Quail Ridge Books in Raleigh. We have a few modest criteria for selection: Not considered were players who came through on a rehab assignment, played only in postseason, and (for the pitcher) a position player thrown to the wolves at the end of a game. Mr. Shelby came over from the Montgomery Biscuits to play one game for the Bulls on July 31, against Charlotte. Box Score. At 25, this was his sixth pro season and, although he didn't have a hit in his one game with the Bulls, he did OK, but not outstanding, with the Biscuits. Stats. Mr. Fleming came up to join the Bulls in Rochester, New York and made two appearances, July 20 and 21. In the first he had a rough time — five batters, one out, blown save — but in the second he did just fine. Overall for a 24 year-old in his fourth professional season he had a good year. Stats. The Rays must think well of him since they have him pitching with the Surprise Seguaros of the Arizona Fall League. That means we are very likely to see him in a Bulls uniform this next season. Congratulations to John and Marquis! Good luck in 2012!